Some brides are very skillful at creating flower arrangements. If you want to try your hand at your bouquet, you might take a look at these sites. As always, practice enough time before the wedding just in case you need to call in some help. Be sure to put the bouquet in a vase of water until the ceremony. Boutonnieres are a little easier since they require a minimal number of floral items. 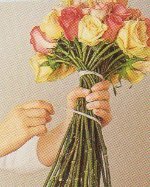 Start with these and see if you will feel comfortable making the bouquets. With these, we might want to keep them refrigerated until the event. Or make then a little longer, place in a jar/vase with water, and cut off to size before pinning them on. 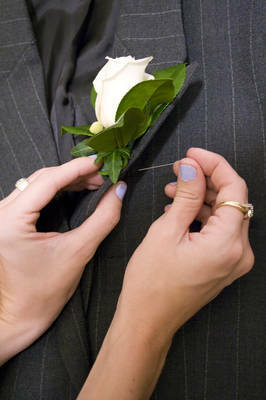 Don’t forget, the boutonnière is pinned on the left lapel.